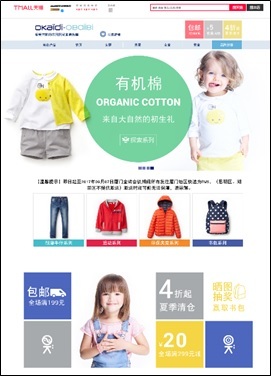 Shanghai transcosmos Marketing Service Co., Ltd., a wholly owned subsidiary of transcosmos inc. , is providing E-Commerce one-stop services for the opening of an official flagship store in TMALL for the “Okaidi – Obaibi” children's clothing brand (URL: https://okaidi.tmall.com/), which is affiliated with the IDKIDS Group (Headquarters: Roubaix, France) and is popular among Chinese consumers. It supports services ranging from store opening applications, store design and operations, planning and execution of marketing, inquiry response for pre- and post-sales support, and product and order management to CRM management, data analysis and preparation of financial reports all at one stop. The IDKIDS group is the largest children’s clothing group in France established for 20 years, which also operates other enterprises in addition to Okaidi - Obaibi, including the high-end children's clothing brand Jacadi Paris, game and toy brands, magazines, nursery schools and workshops. It has established physical stores and official websites in more than 50 countries, with 41 stores in 13 cities in China. Okaidi - Obaibi handles merchandise for babies and children from 0 to 14 years of age and respects the individuality of children, using environmentally friendly high quality materials, based on principles including safety and comfort in children's clothing. The TMALL “okaidi official flagship store” is an E-Commerce shop opened on a third party platform for the first time within the IDKIDS Group, where transcosmos China, which is certified as a TMALL Five-Star provider, receives product supplied from Okaidi - Obaibi and offers one-stop services ranging from product and order management to logistics and delivery. The online shop officially launched sales on April 24, and Chinese consumers can now buy merchandise such as Okaidi - Obaibi brand baby wear, children's clothing and school bags securely and conveniently through the TMALL platform. transcosmos supports Japanese companies and foreign-affiliated companies entering the Chinese E-Commerce market with one-stop services based on many years of experience operating global E-Commerce websites and a track record of providing services in the Chinese market. It opens online shops on behalf of client companies, providing support services including the construction of online shops, organization of product information and store operations, using methods tailored to Chinese consumption habits. It provides an optimal service experience and E-Commerce shopping environment for consumers, while contributing to corporate cost reduction and sales improvement at the same time. transcosmos has achieved rapid business development since entering China in 1995, and now has 34 offices in 15 cities in China. In the E-Commerce business, it supports business development in China in conjunction with the business and brand strategies of client companies, providing services such as E-Commerce website construction and operation, fulfillment (receipt of goods / picking / packing / shipping), customer care, web promotion and data analysis all at one stop. In addition, transcosmos also offers outsourcing services such as call center, system development, BPO and digital marketing. In order to deliver the outstanding products of client companies to Chinese consumers, transcosmos will accelerate business development for E-Commerce one-stop services, including cross-border E-Commerce, in the China E-Commerce market, where major growth is expected in the future. transcosmos launched its operations in 1966. Since then, we have combined superior “people” with up-to-date “technology” to enhance the competitive strength of our clients by providing them with superior and valuable services. transcosmos currently offers services that support clients’ business processes focusing on both sales expansion and cost reduction through our 176 locations across 33 countries with a focus on Asia, while continuously pursuing Operational Excellence. Furthermore, following the expansion of e-commerce market on the global scale, transcosmos provides a comprehensive One-Stop Global E-Commerce Services to deliver our clients' excellent products and services to consumers in 49 countries around the globe. transcosmos aims to be the “Global Digital Transformation Partner” of our clients, supporting the clients’ transformation by leveraging digital technology, responding to the ever-changing business environment.